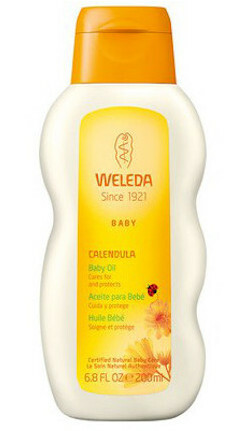 Calendula Baby Oil helps to provide a healthy balance to your child's delicate skin and is dermatologically proven to be skin-friendly, even on sensitive skin. The nurturing combination of organic calendula and chamomile flower extract in this natural baby oil calms and soothes your baby's skin. Nourishing organic sweet almond oil delivers essential fatty acids that deeply moisturize, keeping your baby's skin smooth and supple. Ingredients: Sesamum Indicum (Sesame) Seed Oil, Prunus Amygdalus Dulcis (Sweet Almond) Oil, Calendula Officinalis (Calendula) Flower Extract, Chamomilla Recutita Matricaria (Chamomile) Flower Extract, Fragrance (Parfum), Limonene, Linalool, Geraniol, Citral. Fragrance from natural essential oils.